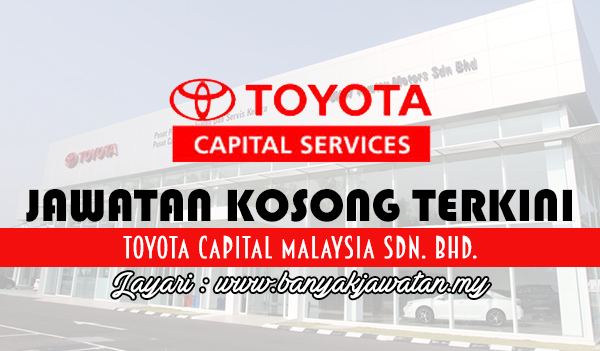 Jawatan Kosong 2017 di Toyota Capital Malaysia Sdn. Bhd | Permohonan adalah dipelawa daripada Warganegara Malaysia yang berkelayakan dan berumur tidak kurang dari 18 tahun pada tarikh tutup iklan ditawarkan untuk memohon jawatan kosong di Toyota Capital Malaysia Sdn. Bhd. TOYOTA CAPITAL MALAYSIA Sdn. Bhd. is a subsidiary of Toyota Financial Services Corporation (TFSC), which specialises in vehicle finance for Toyota Motor Corporation (TMC) around the world, with a global presence covering 35 countries and regions worldwide with managed assets totalling US$183.7 billions as of March 31, 2015. TFSC was established in July 2000 as a holding company for TMCâ€™s financial subsidiaries offering financial products and services to support the sale of vehicles. TFSC focus on offering comprehensive financial services catering to the diverse needs of customers. To date, TFSC has expanded to 35 countries and regions including Americas, Europe, Africa, Asia-Pacific, China and Japan. Wherever it operates, TFSC has remained steadfastly committed to supporting Toyota distributor partners, dealers and customers in producing memorable customer events and top-notch service quality. 0 Response to "Jawatan Kosong di Toyota Capital Malaysia Sdn. Bhd - 28 August 2017"